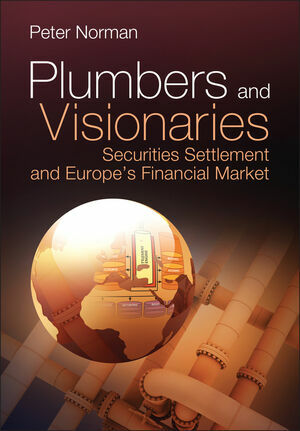 Plumbers and Visionaries: Securities Settlement and Europe’s Financial Market is a path-breaking account of the history and future of the securities settlement industry in Europe. Written by experienced journalist and author, Peter Norman, this book takes a look at the less visible, but nevertheless critical segment of the global capital markets, following the development of securities settlement across Europe’s frontiers. It encompasses the free-wheeling days of the Eurobond market in the 1960s, through the growing integration of the European Union, to the highly regulated and efficient multi-trillion euro business securities settlement it is today. This book is the story of a financial sector that has grown hugely in importance in the 40 years since Euroclear, now the world’s premier settlement system for domestic and international securities transactions, was created to deal with a settlement crisis that threatened to smother the international capital market in its infancy. Beginning with the settlement crisis in the Eurobond market, this book describes how Euroclear and later Cedel, its arch-rival, were founded to deal with the problem. It follows the challenges posed by cross-border settlement for a growing range of securities when most financial infrastructures operated only within national frontiers. The book demonstrates how securities settlement became an issue for public policy after the stock market crash of 1987 and how the problems of cross-border settlement moved rapidly up the European policy agenda after the euro’s launch. More than a mere history, this book engages with the people who created the modern European securities settlement industry and taps into the often entertaining memories of its founding fathers. This book also focuses on the difficulties and challenges of cross-border transactions which have been identified as hampering Europe’s economic growth. It looks at the present state of the industry seeking a way forward so that the securities settlement infrastructure will better serve a single European capital market. Peter Norman is a London-based journalist and writer, specialising in European issues. He began a career in journalism in 1968, as a trainee for Reuters Economic Services in London. He later worked for the Times of London and the Wall Street Journal-Europe before joining the Financial Times in 1988 with responsibility for the newspaper’s UK and international economic news coverage. He spent 22 years of his professional life on the European mainland, based at various times in Frankfurt, Bonn and Brussels. After three years in Bonn as the FT’s chief German correspondent, he moved in 1998 to Brussels as bureau chief and chief EU correspondent. He has combined book authorship and journalism since returning to the UK in July 2002. ‘Plumbers and Visionaries: Securities Settlement and Europe’s Financial Market’, is his second work of recent European history. PART I: NEW PROBLEMS. NEW SOLUTIONS. Chapter 1: Settling Securities Across Borders. 1.1 Turnover in the trillions. Chapter 2: The Eurobond Market and the New York Settlement crisis. 2.1 Autostrade shows the way. 2.2 Foreign dollar bonds and their settlement. 2.3 From Autostrade to the New York Settlement Crisis. 2.5 Settlement Services in Luxembourg. Chapter 3: The ICSDs - Euroclear and Cedel. 3.2 The creation of Euroclear. 3.3 Establishing Cedel in Luxembourg. 3.5 The wider settlement picture. Chapter 4: Euroclear fights back. 4.1 Sale of Euroclear to its users. 4.5 Securities lending and borrowing. 4.7 Prospering in difficult times. PART II: WINDS OF CHANGE. Chapter 5: New Markets, New Tensions. 5.2 1980s – Deregulation and securitisation. Chapter 6: After the crash. 6.1 Strengthening cooperation and national systems. 6.4 Central banks push for DvP. Chapter 7: The Coming of the Euro. 7.3 The EMI and Lamfalussy. 7.4 The growth of Repo activity. 7.5 The ECB and Securities Settlement. PART III: AN INDUSTRY IN FERMENT. 8.1 Euroclear and the boom in domestic markets. 8.2 Lussi and the revival of Cedel. Chapter 9: Change at the Exchanges and CSDs. 9.2 Seifert in Frankfurt - A story of vertical integration. 9.3 Theodore in Paris - Innovation through IT. 9.4 Taurus and Crest - a horizontal system by accident. 9.5 The Swiss Value Chain. 10.2 A European Clearing House? 10.3 A meeting of minds in Marrakech. 10.4 Dark days for Euroclear. 10.5 The fight back begins. 11.1 Euroclear separates from Morgan. 11.2 The creation of Euronext. 12.1 A flurry of initiatives. 12.4 The banks change tack. Chapter 13: Europe with Two Settlement Models. 13.3 Embedding the vertical and horizontal models. 13.4 LCH and Clearnet merge. 13.6 Changes in structures and governance. PART IV: AN ISSUE FOR EUROPE. Chapter 14: The EU reacts. 14.2 The Lamfalussy Committee of Wise Men. 14.4 The cost of fragmentation. 14.8 The G30 and EFR reports. 14.10 The Commission’s second communication. 14.11 The arrival of McCreevy. 15.2 Seifert and the law of unintended consequences. 15.3 Exchange consolidation: an unpredictable catalyst. 15.4 Competition authorities turn against silos. 15.6 For and against a single CCP. Chapter 16: Work in Progress. 16.1 Euroclear’s domestic market for Europe. 16.2: Cesame and the dismantling of the Giovannini barriers. Chapter 17: Frameworks for the Future. 17.1 Two solutions at once. 17.2 The code of conduct. 17.4 T2S - The follow up. 17.5 Questions and more questions. Chapter 18: Conclusions and Reflections. Appendix B. Key dates for the Securities Settlement Industry in Europe. Appendix C. Who’s Who in the History of European Securities Settlement. Appendix D. Glossary of Technical Terms.